On September 4th, in anticipation of President Trump’s decision to sunset legislation protecting illegal immigrant minors from deportation, a group of evangelical leaders issued a public letter under the auspices of “Evangelicals for Biblical Immigration.” The letter supports Trump’s repeal of DACA (Deferred Action for Childhood Arrivals), an executive order issued by Barack Obama. The letter begins with shallow declarations of compassion for immigrants as well as a shout out to #alllivesmatter. Those are reason enough to be disturbed by the letter, but it was something else that really jumped out at me as a professional historian who is also an evangelical Christian. The letter’s reasoning mirrors that of evangelical proponents of segregation in the mid-20th century. While some faith groups use selective Bible words for open borders and amnesty, we consider the whole [emphasis in original] counsel of Scripture. We find that the Bible does not teach open borders, but wise welcome. We are to welcome the lawful foreigner, who, like a convert, comes as a blessing (eg.s Ruth and Rahab). We also find Nehemiah building walls to protect citizens from harm. In Isaiah 1, we see God condemning the destruction of borders and indigenous culture. All lives matter. The lives of North, Central and South Americans matter. The lives of Africans, Asians, Europeans and people from the Middle East matter. In Scripture, we learn that God placed us each in a family, a land, an epic story of creation, the fall and redemption. The Bible envisions a world of beautiful and unique nations, not a stateless ‘open society’ run by global oligarchs. Each of us is called to be a blessing where God has placed us in the world. There is much to pick apart in these statements. For example, the authors assume that the word “nations” in Bible is synonymous with our contemporary system of “nation-states” and, thus, that God would be opposed to globalization. Yet the ethno-cultural nation-state is a modern invention created to more fully harness the capacity of a country to wage mass warfare via centralized taxation, registration, and border control. “Nation” in the Bible means “people group,” closer in meaning–though not synonymous with–tribe than to “nation-state.” There was no capital-‘s’ State in antiquity. So saying that God has a clear opinion on nation-states vis a vis “stateless”-ness just betrays the authors’ ignorance of political theory and history. But the most striking thing about these paragraphs is that the authors have rooted their argument in the idea of fixed ethno-national boundaries. Thus they misquote Isaiah 1 as condemning the destruction of borders and the violation of indigenous culture. Doing so requires some serious reading into the passage, given that the context for the book of Isaiah is the conquest of Israel by the Assyrian Empire. This isn’t a passage about immigration at all but about the consequences of losing a war. Of course, anti-immigration activists often use military language in referring to immigration as an invasion, so I suppose it’s easy for them to buy into their own hyperbole and see illegal immigrant children as some kind of vanguard force. Such is negative reasoning, that God says not to allow such and such. But the authors also make a positive argument, that God says to do such and such. In this case, they believe that God intended for the various peoples of the earth–North, Central, South Americans, Africans, etc…–to stay in their respective homelands, thus the emphasis on “unique nations” and on God’s placement in a particular land. Note also the final sentence; where has God called people to be a blessing? In another country? No, of course not. It’s strongly implied that we ought to remain “where God has placed us in the world.” What God has put asunder, let no man mix together. That is the same basic logic of segregation theology that was widespread among mid-twentieth century white evangelicals. Let’s compare the rhetoric and logic of this letter to that of a prominent pro-segregation preacher of a generation ago. 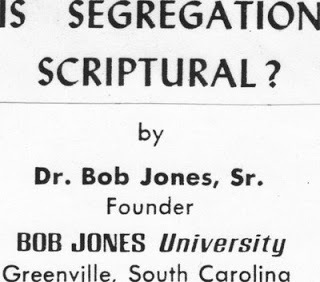 I’ve picked Bob Jones Sr. both because his 1960 sermon, “Is Segregation Scriptural?”, is available online (do read the excellent introduction by Justin Taylor) and because I attended the eponymous Bob Jones University as an undergrad. I know firsthand how damaging segregation theology can be not just to its targets but to its adherents and their descendants. Jones preached the sermon in response to a surge in civil rights activism. In the weeks prior to the sermon, Congress was considering passage of the Civil Rights Act of 1960, sit-in protests were popping up around the South, and evangelist Billy Graham–whom Jones opposed–issued a statement condemning racial segregation. So when Bob Jones spoke into the radio microphone on Easter Sunday, 1960, he wanted to explain why he believed God actually supported segregation. The sermon is lengthy and meandering. Jones repeatedly attests to his love for blacks and his desire for their well-being. I do not doubt that his claims to compassion felt as hollow to most African-Americans at the time as do the protestations of the Evangelicals for Biblical Immigration group sound to DACA recipients today. It is no accident that most Chinese are in China. There has been an overflow in the world, but most Chinese live in China. There are millions and millions of them there, and there are no greater people in the world. I have never known lovelier and more wonderful people than the Chinese. We were over in Formosa a few years ago and conferred an honorary degree on Generalissimo Chiang Kai-shek, and I never met a greater man. I never met a man of more intelligence or a more wonderful Christian; and Madame Chiang Kai-shek is a wonderful woman. There they are. Now, what happened? They married each other. … All right, he is a Chinese. He married a Chinese woman. That is the way God meant it to be. Paul said that God “. . . hath made of one blood all nations of men . . . .” But He also fixed the bounds of their habitation. When nations break out of their boundaries and begin to do things contrary to the purpose of God and the directive will of God, they have trouble. The world is in turmoil today because men and nations go contrary to the clear teaching of the Word of God. Let’s understand that. The Chinese people are wonderful people. They have internal troubles, of course, because Communism has gone into China and disturbed a great deal of the population. But the Chinese people are wonderful people. The Japanese people are ingenious-they are wonderful people. The Koreans are wonderful people. The Africans are wonderful people. In many ways, there are no people in the world finer than the colored people who were brought over here in slavery in days gone by. You talk about a superior race and an inferior race and all that kind of situation. Wait a minute. No race is inferior in the will of God. Get that clear. If a race is in the will of God, it is not inferior. It is a superior race. You cannot be superior to another race if your race is in the will of God and the other race is in the will of God. But the purposes of these races were established by Almighty God; and when man attempts to run contrary to the directive will of God for this world, there is always trouble. Now, that is the trouble. What happened? Well, away back yonder our forefathers went over to Africa and brought the colored people back and sold them into slavery. That was wrong. But God overruled. When they came over here, many of them did not know the Bible and did not know about Jesus Christ; but they got converted. It should be noted what Jones does not say. He is not a biological racist who believes in the genetic inferiority of African-Americans. But his belief that both blacks and whites are equal in the eyes of God doesn’t prevent Jones from also supporting racial segregation. Why not? Because Jones believes that God fixed the boundaries of the nations and that mixing across those boundaries is wrong. That’s why he affirms that “it is no accident that most Chinese are in China,” why he implies that inter-cultural marriage is outside God’s plan, and why he roots the sin of slavery in the mixing of nations that should have remained separate (as opposed to, I don’t know, inflicting tremendous physical, emotional, and spiritual pain on millions, not counting those who died in the transatlantic passage). This is why elsewhere in the sermon Jones can assert that “God is the author of segregation.” What God has put asunder, let no man mix together. Now, let me do a little mash up of Jones’s words and those of the Evangelicals for Biblical Immigration letter to make the comparison more obvious. God loves us all and all lives matter. The lives of Chinese, Japanese, and Koreans matter. The lives of North Americans and Central Americans and South Americans matter. The lives of Europeans and Africans matter. In Scripture, we learn that God placed us each in a family, a land, an epic story of creation, the fall and redemption. God is the author of a world of beautiful and unique nations, not a mixed-up, stateless society. Each of us is called to be a blessing where God has placed us in the world. But the purposes of these boundaries were established by Almighty God; and when man attempts to run contrary to the directive will of God for this world, there is always trouble. What happened? Well, away back yonder Democrats opened the borders through bad laws and illegal executive actions. But now, God has overruled. That little thought experiment took just a few seconds because the underlying logic in Jones’s pro-segregation sermon and in the public letter is fundamentally the same. Our boundaries–whether they be boundaries of race, ethnicity, culture, or national border–are fixed by God. As such, any attempt to alter those boundaries is highhanded rebellion against their true Author. If you are a Christian who sees nothing wrong with the Evangelicals for Biblical Immigration letter, then you aren’t likely to appreciate being compared to a segregationist. But let me show you why both views are not just misguided but ultimately heretical. Ethno-nationalism of this sort is rooted in a basic distortion of traditional Christian theology. Its supporters rip Bible passages out of context. They take verses meant for the particular context of ancient Israel, an ethnic people group governed theocratically, and apply those passages directly to modern America, a multi-ethnic country governed democratically. In other words, they mentally replace every mention of “Israel” with “America.” Americans are now the chosen people, a holy nation, God’s special possession. This is why the authors of the letter exclusively rely on references to the Christian Old Testament rather than to the New Testament. Contrary to their assertion, the letter authors do not consider the whole counsel of Scripture. They are only attentive to those sections that enable their heretical application of God’s promises and commands to Israel to be applied instead to the United States of America. Okay, you might say, what does that have to do with immigrants? I only see widows, orphans, and a generic reference to oppression. Here we turn to Luke 10 in the New Testament. Christ is sending seventy-two of his earliest disciples out to minister, assuring them that towns and families they visit will provide for their basic needs. They can count on local hospitality, which is the selfless extension of one’s resources to those in need for the sake of the Kingdom of God. So when Christ condemns, in advance, those townspeople who will not welcome his disciples and care for them, Christ says they will receive a judgement worse even than Sodom’s judgement. Their inhospitality to strangers from outside their community made them even more worthy of judgement than a place that was legendary for its wickedness. It’s interesting that when he says these words, Christ tells the disciples to inform both hospitable and inhospitable towns of the same truth. They are to say to each that “The kingdom of God has come near,” but for one town that’s a blessing while for the other it is a divine curse. Think of the significance of that charge. These disciples were spreading out all over the Mediterranean world. They would reach not just ethnic Jews, but all peoples. Soon, Cornelius the Roman centurion would be made a disciple, along with Apollos the Greek and Simeon the Niger. The ethno-cultural nation of Israel was being subsumed as the kingdom of God drew near, replaced by a multi-ethnic, polyglot, marvelously mixed Kingdom composed of every tongue, tribe, and nation. This is why the apostle Paul could write that in Christ “there is no Gentile or Jew, circumcised or uncircumcised, barbarian, Scythian, slave or free.” That is the promise of the New Testament gospel, a radical faith completely free from any remaining shred of ethno-nationalism. Indeed, that’s why the NT authors spend so much time condemning Jewish converts who attempted to exclude non-Jewish converts from their churches. These “bewitched” Jewish believers were reverting to the old ethno-nationalism. That’s why Paul criticizes Peter for trying to “force Gentiles to follow Jewish customs” (Galatians 2:14). The New Testament expressly rejects the ethno-nationalist understanding of the Christian faith in the strongest possible terms. Yet now we have self-proclaimed Christians falling back on ethno-nationalist lies. These lies feel safe; they do not ask believers to extend something so radical as Biblical hospitality. They do not threaten the identity politics that blinded most white evangelicals in the last election. It’s easier to blame foreigners for our nation’s ills than to consider our own culpability. And so we craft a heretical theology that justifies our beliefs and our votes.